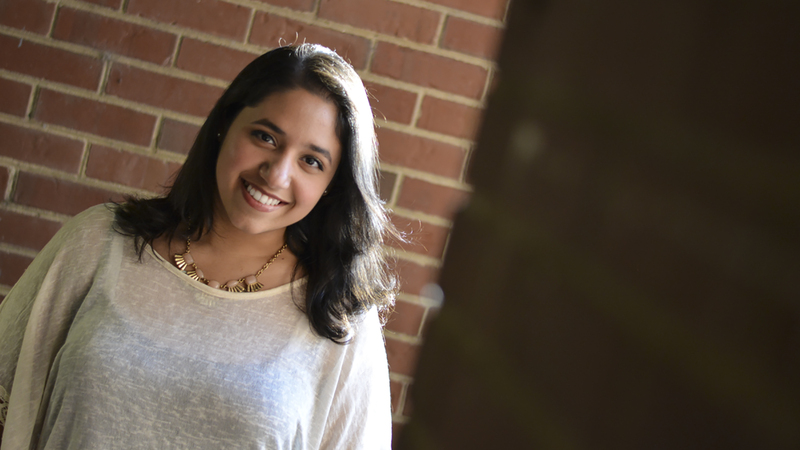 Waxhaw native Catrina Rateb ’18 knows the importance of making the most out of every opportunity at NC State. Goodnight Scholars Program: Tell us a little bit about yourself. 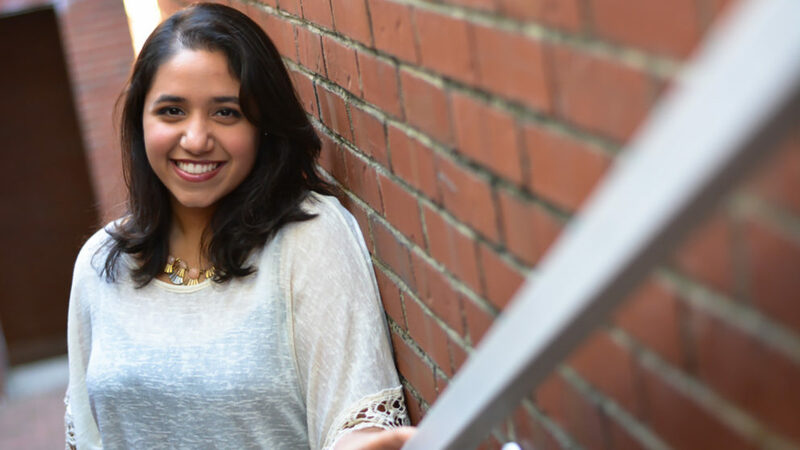 Catrina Rateb ’18: Originally I am from Cairo, Egypt and spent a few years of my life there. My family decided to immigrate to the United States of America in hope to give me and my brother a bright and prosperous future without religious persecution. It was an especially difficult decision for them to leave everything that was familiar and start a new life in a completely different country. Since then, I grew up in Charlotte, North Carolina where I resumed my schooling in Mecklenburg County. I live in a little town called Waxhaw, which is a few minutes drive from Charlotte. I attended Marvin Ridge High School and have a younger brother who is a rising sophomore there. I used to play the violin for the Union Symphony Youth Orchestra and sing for the Charlotte Youth Chorale. I am fortunate to have come from a diverse background because it has instilled in me a love for learning new languages and an appreciation for cultural traditions. Graduating from high school, I knew I wanted to choose a career path that would allow me to combine the principles of math and science to solve present problems. Since I was going to attend NC State, engineering seemed like a good pick for a major but I still had no idea in what discipline. I explored the various options in the College of Engineering and decided that chemical engineering was the best suit for my interests. What are some of your biggest accomplishments at NC State thus far? During my first year at State, I made the Dean’s list for both semesters. Something not uncommon for Goodnight Scholars, but an achievement all the same. I was involved with the Society of Women Engineers, JORI, the University Honors Program, Orthodox Christian Fellowship and the NC State Chorale. However, I feel that my biggest accomplishment was taking the decision to study abroad in France this past summer. I thought I would not be able to study abroad because of scheduling and the few options for engineering courses in specific countries, but I had always wanted to go to France after studying French since middle school. The opportunity presented itself when I decided to minor in French after receiving six credits from the AP exam. Embarking on this trip with NC State faculty and students has been one of the most memorable times in my life. I had a very enriching experience and learned way more than I expected, and I’ve found that I am a much more confident, independent person thanks to being in a different country, navigating a new environment, and traveling on my own. What is like being in the Goodnight Scholars Program? Without a doubt, my Goodnight Scholars Program experience has been incredible and a true blessing. I purposely use the word “blessing” because it has positively affected my life in multiple ways ranging from relieving a financial burden from my family to allowing me to partake in highly organized social, professional, and service activities. Coming to a big state school from a small high school was definitely a big transition and put me outside of my comfort zone. I am a first-generation American college student and had no idea what to expect. The Goodnight Scholars Program alleviated this culture shock because it provided a small college feel by introducing me to other students and mentors with similar academic ambitions. Starting from the first retreat of the year, I met some of my closest friends and continued to meet people by attending a wide variety of events offered by the program. Now, I have formed relationships with staff, professors and students thanks to the Goodnight community. …being a Goodnight Scholar means striving for excellence in all that I do. What does being a Goodnight Scholar mean to you? To me, being a Goodnight Scholar means striving for excellence in all that I do. It means realizing that I am part of a team that works together to improve, achieve and set new goals. As a Goodnight Scholar, I am a living investment in North Carolina’s future and, as a result, I feel obligated to give back to this state by using the education and skills I have attained as part of this university and scholarship program in some shape or form. Last, but not least, I recognize that being a Goodnight Scholar is an honor and understand that this title should be kept with humbleness and gratitude as I am a reflection of this program’s values and mission to NC State. To be a member of this Program means to be a part of an intellectual, compassionate and serving community that is constantly paying it forward. Where do you see your career goals taking you? So the answer to this question is constantly changing day by day. The answer for today is that I want to work in the pharmaceutical industry as a chemical engineer after I graduate. Alongside working, I have plans to attend graduate school to receive a Master’s of business administration. Additionally, I want to pursue a Science and Technology Policy Fellowship with AAAS to “advance science, engineering, and innovation throughout the world for the benefit of all people.” Ideally, I would like to travel internationally and work alongside engineers from a global perspective. Ultimately, whatever career path I choose, I aspire to create viable solutions to the growing issues of the world in hope to contribute to a better society. How has the Goodnight Scholars Program prepared you for life after college? Whether it was visiting Biogen, receiving advice from SAS professionals during a mock interview, or eating dinner with NC State Faculty and STEM leaders, the Goodnight Scholars Program has constantly presented me with new connections and knowledge to grow and develop into a well-rounded individual. I have gained key insight into how to handle myself in career fairs, interviews, and net-working events. I have developed soft-skills that have helped me in various situations and attended workshops that increased my awareness on professional etiquette and formal attire. By the end of my undergrad career, the Goodnight Scholars Program will have equipped me with a skill set good enough to tackle any job and a support system that will always be there for me. What advice would you give to a prospective NC State student and/or Goodnight Scholar? Take advantage of all of the opportunities that are presented to you and don’t be afraid to jump right in with the program! Your time with the Goodnight scholars will be invaluable and defining to your overall college experience. Get involved with organizations that are most meaningful to you and manage your time wisely. Overall, Enjoy your time as a member of the Wolfpack!